An excellent database of Scottish League Select matches exists on the LondonHearts website (compiled by David Ross). And I recently bought Tommy Malcolm's excellent book on Glasgow v Sheffield. * Glasgow Select, other than v Sheffield / in Glasgow Charity Cup? (Or any other Selects, for that matter... was there ever a Dundee Select post-war, for example?). Obviously some will count as 'friendlies' in most people's eyes, especially games like "City Select v English Club" or "Scottish Club v Scotland XI". However, others are more competitive affairs... especially matches between 2 representative teams (especially League v League or City v City). 'Scotland The Team' by Andrew Ward (Breedon, 1987, ISBN 0 907969 34 8) has results, dates, venues, scorers, attendances, line-ups for all U-23 games and for U-21 from 1976-Apr 1st 1987. Also an A-Z of players appearances at both levels with matches and totals. 'British and Irish Special and Intermediate Internationals' by Keith Warsop (SoccerData, 2002 ISBN 1 899468 62 5) has the same information (minus players A-Z) for pre-1872 'internationals,' B internationals, SFA tours, wartime internationals, one-offs like the Jubilee 'international' of 1935, Olympic appeal fund match of 1956 etc. Excludes U-21 but contains U-23. Covers 1870-1999. Also has details of make-up of touring parties. It doesn't include the likes of Scottish Second Division Select games, Scottish Second XI FA Games (other than when they were responsible for the Under 23 side) or the Scotland Semi Pro Select (who usually played a warm-up game prior to the 4 Nations Tourament each year). I hadn't really thought about the Scottish Second XI FA games or the Semi-Pro games of the late 1970s + early 1980s, but these are all below the top-tier and so not as important for me. (Although it would still be interesting to see a comprehensive listing / or perhaps compile one, if one doesn't exist). Also, on a semi-related note, does anyone know where I could get ahold of a copy of "The AFS Book of Inter-League Matches"? I've not found anything online . I could modestly recommend my own Scotland International Programme Guide, which was published in 2008 and is available on ebay for a fiver. It has complete listings (date, venue and score) for Scotland matches at A, B, League, Unofficial, U23, U21, Amateur, Women, Sem-Pro and Youth. This match is considered a full international by the USA. That's superb ScottishFA, thanks... I meant to buy your program guidebook before. I've searched "Scotland International Programme Guide" in Ebay but nothing has come up - could you post a link? If I can track-down a copy of the 'AFS Inter-League', I think I've everything covered bar City Selects (Glasgow v teams other than Sheffield / Charity Cup... plus Edinburgh, possibly Dundee). Any ideas for these City Selects? This is a full list of the matches played to raise funds for Edinburgh Charities Day. 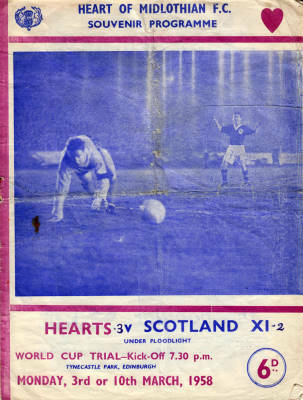 The series began with a Hearts match against Arsenal, there was no game in 1942, and in 1943 it was a ‘Hearts Select’ including players from Hibs and some English sides. From 1944 to 1962 an Edinburgh Select met a top English side as a curtain raiser to the season (except 1946 when it was played in June), and the final match in the series was between Hearts and Dunfermline. Again, superb, thanks. Those games were apparently for the "Allison Trophy" going by programme covers. A possible Edinburgh Select v Sarajevo at Meadowbank (1990s presumably) [not necessarily played by 'proper' players, of course]? If anyone knows of other City Select (or other) games, from any era, please do chip in. Out of interest... does anyone know when the annual Edinburgh-Glasgow match died off? And did Edinburgh have a similar "annual test", like Glasgow-Sheffield? What about Scottish city matches v other English cities, like Liverpool / Manchester / Birmingham / Nottingham, etc.? Last edited by HibeeJibee on Wed Mar 09, 2011 12:38 am, edited 1 time in total. Stirlingshire FA XI played testimonials, the most recent being in the late 70s for Gordon Simpson. They also played a one-off game in the North East of England, possibly at Whitley Bay, in the 1990s although the reason for this escapes me. Dundee Select XIs have played in Testimonials at Dens and Tannadice in the 70s, if not since. SL Team: Brownlie (THirds), McGregor (Celtic), McKenzie (Partick), McStay (Motherwell), Rafferty (Airdrie), Nellies (Hearts), Waugh (Motherwell), Crone (Celtic), Reid (Airdrie), Graham (Hearts), McGregor (Celtic).